Nowadays, all most 99 percent of people around the word consider supplying hygiene food to take care their own health well, especially get away from diseases. Taking care health in this way, they can do it easily just by eating vegetables, fruits, fishes, and meats that are free from chemical substances. For vegetable and fruit, we can find it in village; especially we can grow by our own self. Preparing daily food can be made by everyone, especially youths who are in lower secondary school age because they have to help their parents work in their house as well as help to think about daily food expenses. 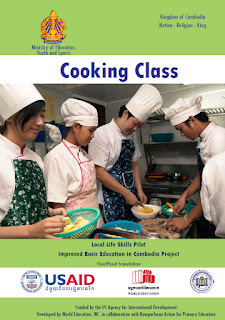 Therefore, showing about how to cook is very important for students in this level. During the activities in this manual, it is advised to use the help of community members. They can assist in teaching, overlooking the cooking activities and supply the necessary material.